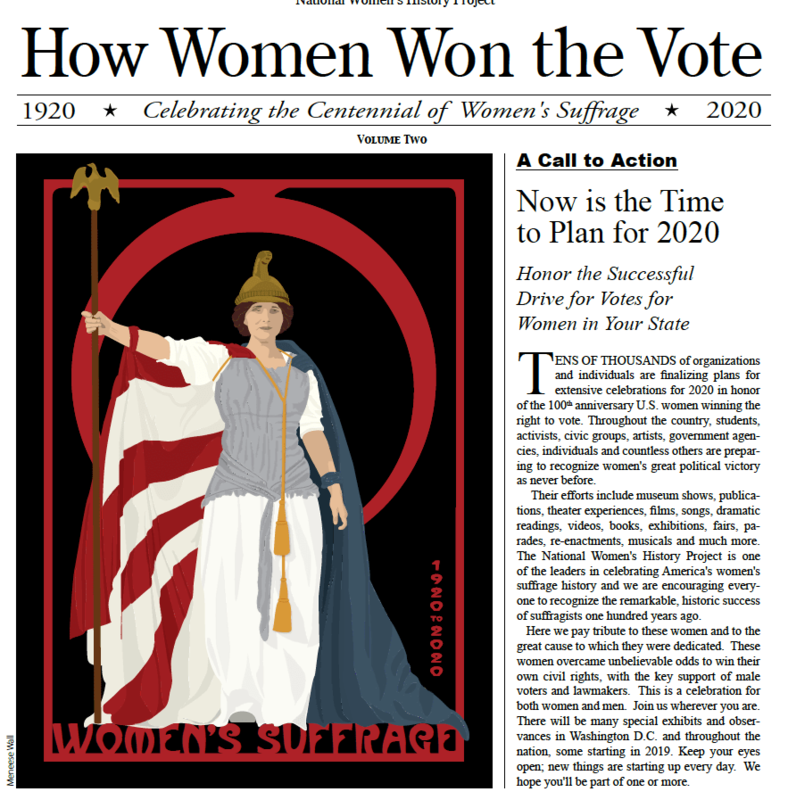 Advertise in the Gazette in 2019 for the national suffrage centennial! Votes for Women news to prepare for 2020 suffrage centennial on Vimeo. 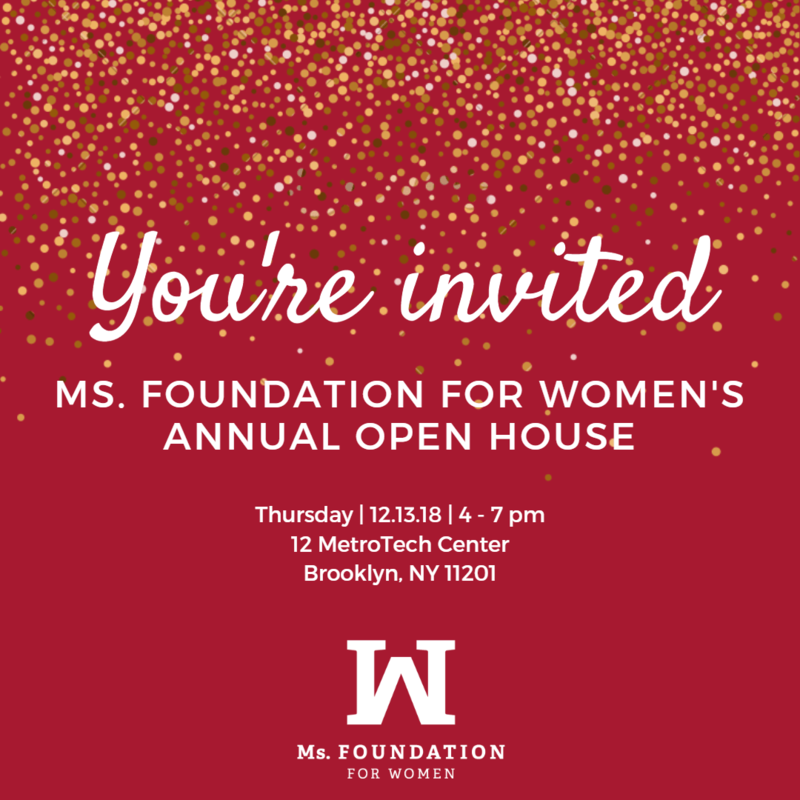 CONSIDER ADVERTISING FOR THE 2020 VOTES FOR WOMEN CENTENNIAL! Consider advertising your event, celebration, etc. 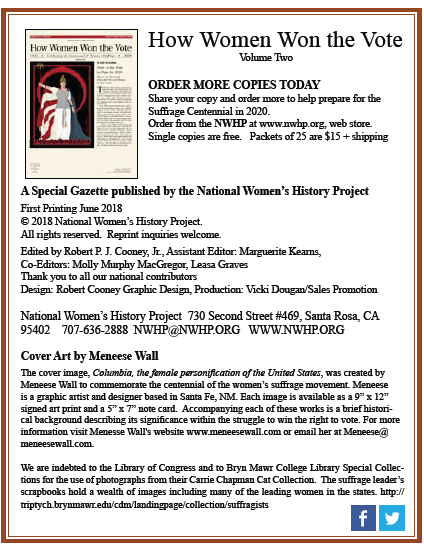 in the National Women’s History Project’s Gazette, “How Women Won the Votes.” It is chock full of information, resources, memorabilia, books, and much more. SuffrageCentennials.com has been publishing since 2013. Visit Suffrage Wagon News Channel for news and views about the first wave of the women’s rights movement in the US. LetsRockTheCradle.com provides updates about action campaigns. Follow InezMilholland.wordpress.com, a site that has been publishing since 2016 for the 100 anniversary of Milholland’s death, a commemoration sponsored by the Women’s History Alliance, formerly the National Women’s History Project. IN OTHER NEWS FOR 2020 CENTENNIAL: One of the many events and celebrations coming up over the holidays! LetsRockTheCradle.com is a public service for media inquiries about the 2020 votes for women centennial. SuffrageCentennials.com gives an overview of events and celebrations. This entry was posted on December 3, 2018, in Blog and tagged Gazette, how women won the vote, Inez Milholland, National Women's History Project, suffrage centennials.